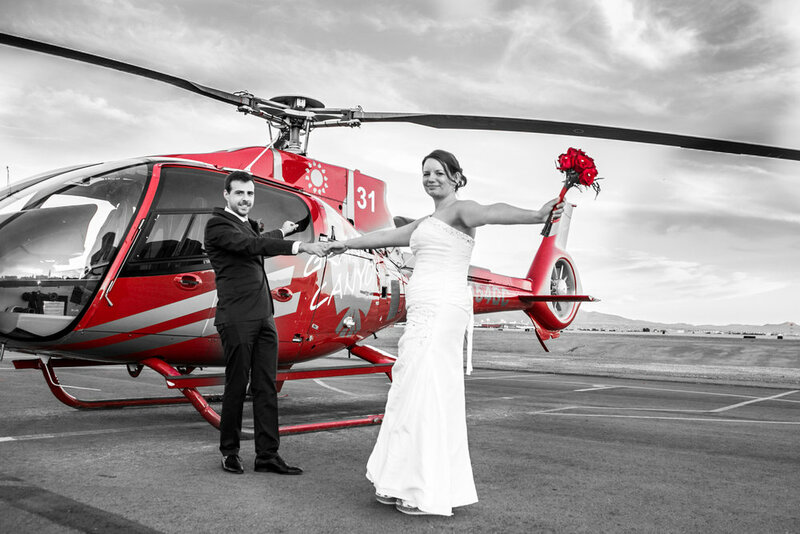 The Las Vegas Helicopter ceremony is a perfectly unique and exhilarating wedding. Choose from our glitzy Over the Strip Ceremony or the destination grand canyon ceremony and be dazzled by the scenic views and fascinating story. What could be more exotic than getting married in a helicopter flying over the Las Vegas Strip? Have a beautiful Grand Canyon Ceremony and say "I Do" inside a natural world wonder. Your day will begin with pickup from your Las Vegas hotel by limousine. Upon arrival at the helicopter terminal, you will be greeted with a 12 rose bouquet and matching boutonniere by your pilot, minister and your professional photographer. Once in the air above the Las Vegas Strip, enjoy views of Las Vegas' iconic casinos as you make your way to the Grand Canyon. Fly over Lake Mead and the Hoover Dam before landing in the basin where your ceremony will be held. If there is a more unique and breathtaking wedding ceremony in Las Vegas, we haven't seen it. At Helicopter Ceremonies of Las Vegas our mission is to deliver spectacular weddings and commitment ceremonies, useful for Vow renewals and proposals also. Our wedding packages offer the most value and incredible memories. Our Grand Canyon Destination ceremony offers amazing views of the natural landscape, and a chance to get married inside of a natural wonder of the world. In addition to a multitude of optional extras and upgrades our ceremony packages include flowers, world-class professional wedding photography and a champagne toast.